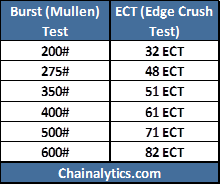 Mullen Burst tested board had long been the industry standard for grading corrugated board for secondary and tertiary packaging, (aka Shipping cases). As corrugators started utilizing more and more recycled content in their corrugated board, it was discovered that recycled board of the same basis weight did not always perform as well in the Mullen Burst test but still had some very good vertical compression qualities. Somewhere along the line, ECT (Edge Crush Test) was developed as another method of grading corrugated board. The Mullen Burst test pressures a rubber diaphragm bubble against the board in a defined area to measure the pounds of pressure per square inch to burst the board. The ECT test takes a defined sample board size and measure the straight compression force for that sample size. In general, Burst grade boards contain more virgin material, which means it has longer and interleaved fibers. ECT usually has a higher recycled content, which makes it less expensive, but the fibers are often worked more and shortened. Some paper mills will dye their higher recycled paper a darker tint to give it the appearance that there are more virgin fibers in the paper. Often the mills that produce the paper with shorter fibers use special processes to align the fibers in a vertical orientation to help with top to bottom compression strength, but the board often lacks impact strength of burst board. So if all you do in straight column stacks of product, that does not bulge out against your container and store in controlled environments, you should see very similar performance between ECT & Burst. 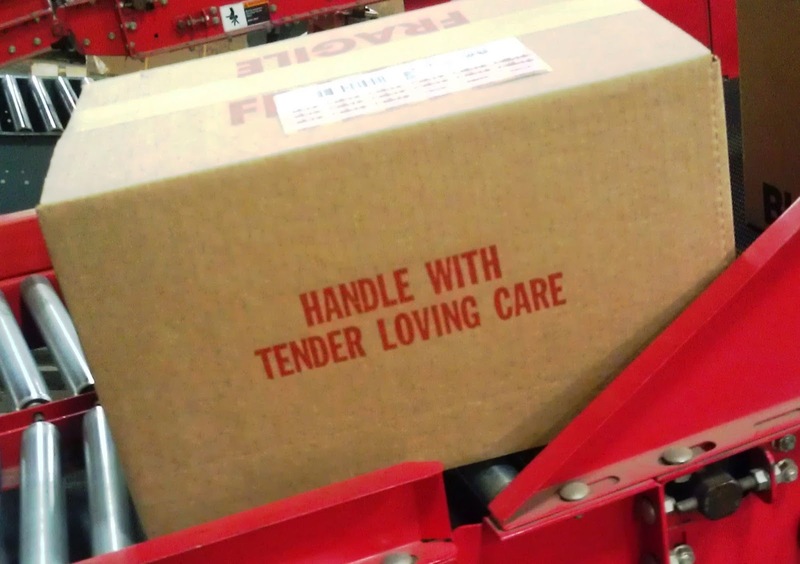 On the hand, most companies do not have these ideal conditions, and handle & restack their boxes many times within their own distribution channels. And we all know the distribution hazards of shipping in a single parcel environment through UPS or Fedex can also wreak havoc on your packaging design and may require different materials or a different protective packaging strategy. In this case, you should see much better overall box performance from the Mullen Burst board because of the configuration and natural strength of their longer fibers. You can also combine Mullen weight papers with traditional ECT papers to help offset costs and still create a better box. This is still relatively uncommon due to the special paper combinations and high volumes needed. In summary, sometimes ECT is the right choice and saves money, but many times the ECT will cost you in the long run with increased damage and customer dissatisfaction. If it all seems like too much to digest, or if you need help with distribution packaging solutions, let the Packaging Engineers at Chainalytics help you out! This is a great article and it elaborates as well as describe very comprehensively about the difference between a corrugated packaging and an E.C.T.This article is very informative and too worthwhile as well. Hi, What if I tell my vendor to make carton only on ECT basis and not the BS? Will that affect the strength quality/ pricing or other parameters? Great Article.... Is there any formula through which we can relate these two terms? This is a great article, and confirms what I've observed all along. The problem is however, the box companies seem to go out of their way to force ECT on everyone. I have observed the same. Most corrugated Sales reps really don't know the difference & sell on price, so they are going to go with ECT almost every time. Also, ECT has become so much more common and prevalent for many plants, Burst grade paper becomes a specialty item for them.